A bizarre footnote in 80s and early 90s pop culture, the Teenage Mutant Ninja Turtles have managed to live on through comic books, several animated TV shows, merchandising opportunities and – to date – six major film releases (and that’s not even touching upon that rock concert tour they actually went on), all of which have cemented their place as the prime example of what we were willing to get behind as children. It’s a phenomenon that has clearly worked its way into the heart of director Dave Green, previously responsible for the family sci-fi found-footage movie Earth to Echo, a passion that clearly comes through in his sequel to the Michael Bay-produced 2014 reboot of the film series, which this film is not only a marked improvement upon, but also a surprisingly entertaining slice of dumb fun for anyone who has even the slightest connection to the Ninja Turtles craze to begin with. Focusing way more on the Turtles themselves than last time, with Megan Fox and Will Arnett as reporter April O’Neil and cameraman Vern Fenwick respectively taking far more supportive roles here, the main quartet – Leonardo (Pete Ploszek), Raphael (Alan Ritchson), Michelangelo (Noel Fisher) and Donatello (Jeremy Howard) – have to deal with the resurgence of their arch-nemesis the Shredder (Brian Tee), who has partnered with mad scientist Dr. Baxter Stockman (Tyler Perry) to create a pair of new mutants, the warthog Bebop (Gary Anthony Williams) and the rhino Rocksteady (Stephen “Sheamus” Farrelly), to do his evil bidding. What’s more, the Shredder has also plans with an interdimensional alien named Krang (Brad Garrett) to conquer Earth, and the Turtles must battle these foes as well as their own personal turmoils, with the help of O’Neil and vigilante Casey Jones (Stephen Amell). If you grew up with the Ninja Turtles in any way shape or form, then you likely read that plot summary with all the glee of a happy schoolkid who’s rushed home in time for the next episode of the animated show. It is very clear that this was made for all those who stuck with the franchise since its inception, and even though it operates within the semi-rebooted universe established in the 2014 film, it manages to incorporate a lot of what made the Turtles so popular in the first place, from the child-friendly sense of humour to the light-hearted but slightly edgy tone to the genuine comradery between the four reptilian pizza-loving heroes. Make no mistake, this is very much a Teenage Mutant Ninja Turtles film – they even play the catchy theme song during the end credits – and it’s exactly as goofy and delightfully silly as you’d expect. For the most part (aside from the odd lusting over Fox’s body, particularly during an early sequence where she changes into a skimpy schoolgirl outfit for no real reason), Green manages to resist producer Bay’s more troublesome trademarks to bring to life the cartoony and appropriately over-the-top feel of past Ninja Turtles incarnations, more successfully than even Bay could do with any of his Transformers movies. The Turtles themselves, for example, have exactly the personalities most will remember them for; Michelangelo is the jokey one, Donatello is the tech genius and so forth, with none of them feeling like pale imitations by writers wanting to make a quick buck off of the franchise but closer to the actual characters that have formed the centre of the entire enterprise (by the way, for those complaining about their uglier CG appearance in the previous film, they look a lot better here). This film also introduces on-screen for the first time fan-favourites Bebop and Rocksteady, and they are fun side attractions who don’t take up much of our time; they’re thankfully used as sparingly as possible, though it’s easy to understand why they would annoy anyone even in their allocated screen time. They’re about on par with past versions of the characters, something that Green is very wise to keep intact without changing too much; he also finds the joy in several action scenes, from explosive car chases to fighting a tank on a Brazilian river, which manage to entertain even the most pessimistic audience member. However, there are moments when Bay’s influence can get in the way of most things, often to a fault; aside from the aforementioned Fox-ogling, it contains so much CGI that it’s sometimes hard to tell what’s happening and who to; there may not be as much product placement or cross-promotion this time, but when it’s there it can be painful (the most memorable, for better or for worse, is when there is an entire scene dedicated to one of the Turtles encountering a cosplayer dressed as Bumblebee); and it can try to cram in as many recognisable characters as possible like Casey Jones or Krang and not give them much to do other than show up because they’re well-known to the franchise. Spare a thought, also, for Laura Linney as a government official hunting the Turtles who looks and acts like she’s wondering how she winded up in such a dumb movie. But for her benefit, at least it’s an enjoyably-dumb movie like Teenage Mutant Ninja Turtles: Out of the Shadows. Yeah, it’s silly, but what else did you expect from a film about four anthropomorphic reptiles that practise ninjutsu and eat pizza? 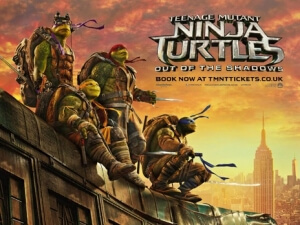 Teenage Mutant Ninja Turtles: Out of the Shadows is a marked improvement over its 2014 predecessor, and while it can’t quite shake off the influences of producer Michael Bay it is an enjoyably fun if dumb family action movie that pays enough loving homage to what made the Turtles so lovable in the first place to appease any long-term fan of the franchise.